This album was released in Norway on 6 August 2007 in a double jewelcase and released in the UK in a gatefold sleeve on 5 May 2008. The album includes a selection of previously released tracks, some re-worked versions and brand new songs. The cover features a drawing of a young boy looking closely into the eyes of a bird and another bird flying by. 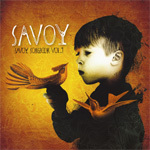 The Savoy logo is printed in large white letters with the title in black underneath. There are two different promotional editions of the album which come with a 6-page colour 7" sized booklet which has a similar cover to the regular CD. Both discs in the set are blue, similar to disc 1 of the regular release, but with slightly different centre hole design. The Norwegian edition includes transparent CD holders in the front and back which house the discs plus Norwegian info text by Sindre Kartvedt. The English edition has white "felt" like CD holders and English text by Sindre Kartvedt. There is a variation of the Norwegian edition, as above, but comes with two CD-Rs which are white with a picture of the regular album cover on the right hand side. 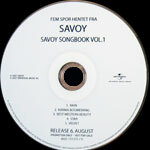 The titles "Savoy Mastered Album 2007" and "Savoy Mastered Album 1994-2004" respectively are printed in black at the top of the discs with the track listings at the bottom. There is a 5-track promotional album sampler which features the tracks Rain, Karma Boomerang, Best Western Beauty, Star and Velvet. The disc comes in a transparent vinyl sleeve with a copy of the regular 6 page CD booklet. The disc is white with the title, track information, release data and "Promotion only - not for sale" printed in black.